We are continuing with the preparation of our annual symposium, the preliminary program can be found on the ReSMiQ web portal (Annual Symposium 2018). In addition to the presentations given by international experts, a large number of posters summarizing the work of our students will be presented at this symposium. We hope to see you there in great numbers. On the other hand, the preparations for the IEEE NEWCAS 2018 conference are progressing rapidly. Authors were informed of the outcome of the review process, the acceptance rate is 49%. In pursuing the objective to present a conference of the highest standard, three renowned speakers will give plenary sessions. The program is on the conference web portal (newcas2018.org). We wish to convey our thanks to all those who contributed to the success of this edition of NEWCAS and we invite all members of the ReSMiQ to participate in great numbers. On another level, we welcome the new student committee of ReSMiQ. This committee brings together a student representative at each of the 9 partner institutions. Its mandate is to disseminate the various activities and announcements to students and help promote ReSMiQ. One of the 9 student representative also seats on the executive committee. We invite members of ReSMiQ who have announcements to circulate among all members and students of the center to send them to us. They will be posted on the ReSMiQ web portal in the News> Announcements section. By the same token, we invite all researchers and students to visit this section regularly to be informed of recent announcements. – Dr. Lakhssassi from the Université du Québec en Outaouais received an Engage grant from NSERC in partnership with the company Nandbox Inc.
– Dr. Langlois from Polytechnique Montréal is technical program co-chair for the conference DASIP to be held in Porto, Portugal, from October 9 to 12. David Stoppa from ams-Heptagon presented the seminar entitled « Time of Flight 3D Sensing and Imaging: detectors, readout circuits and data processing » organized as part of our continuing training program in collaboration with the IEEE Montréal’s chapters of the Solid State Circuit Society (SSCS) and the Circuits and Systems Society (CASS). 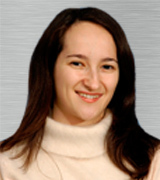 Gabriela Nicolescu received the Ph.D. degree in Microelectronics from the Institut National Polytechnique de Grenoble, France. She is currently a Professor and the Director of the Heterogeneous Embedded Systems Laboratory in the Department of Software and Computer Engineering at Polytechnique de Montréal, QC, Canada. She co-authored more than 190 papers, including journal articles, conference papers, books, book chapters, and holds two patents. Her current research interests include the design methodologies, programming models, and security for advanced heterogeneous systems-on-chip integrating advanced technologies. She is on the organizing committee of several international conferences and is has been a member of different Journal Editors Committees. Ayari, R., Nikdast, M., Hafnaoui, I., Beltrame, G. & Nicolescu, G. (2017). HypAp: a Hypervolume-Based Approach for Refining the Design of Embedded Systems. IEEE Embedded Systems Letters, 9(3), 57-60. Hafnaoui, I., Ayari, R., Nicolescu, G. & Beltrame, G. (2017). Scheduling real-time systems with cyclic dependence using data criticality. Design Automation for Embedded Systems, 21(2), 117-136. Nikdast, M., Nicolescu, G., Trajkovic, J. & Liboiron-Ladouceur, O. (2016). Chip-scale silicon photonic interconnects: A formal study on fabrication non-uniformity. Journal of Lightwave Technology, 34(16), 3682-3695.
de Magalhaes, F.G., Priti, R., Nikdast, M., Hessel, F., Liboiron-Ladouceur, O. & Nicolescu, G. (2016). Design and modeling of a low-latency centralized controller for optical integrated networks. IEEE Communications Letters, 20(3), 462-465. Ayari, R., Hafnaoui, I., Aguiar, A., Gilbert, P., Galibois, M., Rousseau, J.-P., Beltrame, G. & Nicolescu, G. (2016). Multi-objective mapping of full-mission simulators on heterogeneous distributed multi-processor systems. Journal of Defense Modeling and Simulation: Applications, Methodology, Technology. Li, H., Fourmigue, A., Le Beux, S., O'Connor, I. & Nicolescu, G. (2016). Towards Maximum Energy Efficiency in Nanophotonic Interconnects with Thermal-Aware On-Chip Laser Tuning. IEEE Transactions on Emerging Topics in Computing, 13 pages. Fourmigue, A., Beltrame, G. & Nicolescu, G. (2016). Transient thermal simulation of liquid-cooled 3-D circuits. IEEE Transactions on Components, Packaging and Manufacturing Technology, 6(9), 1349-1360. Designing complex embedded systems requires simultaneous optimization of multiple system performance metrics that can be addressed by applying Pareto-based multiobjective optimization techniques. At the end of this type of optimization process, designers always face Pareto Fronts (PF) including a large number of near-optimal solutions from which selecting the most proper system implementation is potentially infeasible. In this letter, for the first time, we present HypAp, a hypervolume-based automated approach to systematically help designers efficiently choose their preferred solutions after the optimization process. HypAp is a two-stage approach relying on clustering Pareto optimal solutions and then finding a subset of solutions that maximize the hypervolume by using a genetic algorithm. The performance of HypAp is evaluated through applying HypAp to the PF by the case study of mapping applications on network-on-chip-based heterogeneous MPSoC. Fig. 1. Hypervolume indicator for the non-dominated solutions with respect to the nadir point in a bi-objective optimization problem. Fig. 2. Case study of a network-on-chip (NoC) mapping problem with three objectives; load variance, communication cost, and energy consumption. (a) We apply HypAp to the PF, obtained by mapping the generated task graphs on the NoC architecture. HypAp first classifies the optimal solutions on the PF into four clusters. Solutions in each cluster are indicated using a unique color in (b). As can be seen, clusters represent different aspects of the PF with respect to the cost functions. TABLE I Comparing the reduced Pareto Front (RPF) Obtained Using HypAp and K -Means with the PF of the NoC Case Study. The RPF obtained using HypAp has a better uniformity compared with that from K -means and even the one from the PF itself.